You must make reservations at least 5 minutes in advance of the time at Green Forest Restaurant. Private room can be used on Tuesday , Wednesday , Thursday and Sunday all day only. Authentic Brazilian churrasco sliced at your table. We offer 18 different kinds of meat, a hot buffet with 5 Brazilian dishes include feijoada daily, a salad bar with sushi and sashimi made fresh by our sushi chef. All of our desserts are homemade. We recommend that you check out our wine list, enjoy a Caipirinha, brazilian drink, our homemade sangria and much more. They are always great when we come. Our 3 year old loves coming to Green Forrest. He always wants to pick up the meat with his tongs! This place is phenomenal! The meats are AMAZING and the bar has so many outstanding DELICIOUS items as well...It's nearly impossible to narrow down your choices!! Everything was great made my bday a great experience. I love Green Forest! The food is always fresh, hot, and perfectly seasoned. The chimi steak is my absolute favorite. They've got an amazing wine list, as well. And the staff is always fantastic! I have been to the Green Forest many time before my last visit and it has gone downhill. The meat selection was lacking but what I had was good. I had my card on green almost the whole time and was passed by more times. While my waitress was nice sh wasn't very attentive as other wait staff stopped by to refill my drink. The salad bar selection was good and I was pleased with that but for a bill over $100 for just me and my husband I would have to say I am very disappointed and wouldn't go back. The staff went to great length to accommodate my partner, who is somewhat grumpy about new experiences. He left with a huge smile and has been reflecting positively on both the feast and the personal touches that went in to every interaction. From bringing him well-done meat to french fries to help him get going, this place is focused on the experience and our shows. Btw, the food was excellent! Love this place. We get there at least 2-3 times a year. Would have got 5 stars , but only got 4 for food because past couple times they haven't had yucca, and I've only got swordfish once there sadly. And I loved it and never eat fish, so it's been sad that I finally had fish I loved and haven't gotten it since. Otherwise, you can't beat green Forest if you are a steak/meats lover. One of the best quality and value in the Pitt area. Love the Food, Service and atmosphere! The food is fresh, hot and every bite is amazing! Bacon, Bacon, Bacon... big cubed hunks of bacon! The Bacon is a MusT try! Our waitress is always wonderful! Never letting our drinks go empty and always bringing fresh clean plates. Everyone is always eager and ready to serve you with a friendly smile! I Absolutely loved the green forest in the past. However, that is no longer the case. I am extremely disappointed with the carved meat, hot sides and cold salad bar. The quality has decreased tremendously. It was our son's 15th birthday and we like to provide different food and restaurant choices regularly but especially during special occasions. The Green Forest went above and beyond any of our expectations. Our server Jax was AMAZING!!!! She gave us a detailed overview of the restaurant and recommended several things like the classic Brazilian cocktail which my husband and I tried in the passion fruit flavor which was DELICIOUS, as well as their complimentary fried bananas drizzled with a bit of honey, WOW!!!!! Fabulous as always! we love Green Forest! Great staff and owners! Horrible! Please don't go unless u want to step in the 80's time zone. Bathrooms dirty! Food setup horrible. For the money go TO TEXAS DE BRAZIL!!!!!!! U WONT be disappointed. Meat here bland. I waited forever for the cook I wanted. Mistake on my part to travel from SHills to Penn Hills. Will never go back nor will I ever recommend this place! I feel as though this restaurant is a great place for celebrating. It is costly, and I can only eat so much at one time! But it is fun! The salad bar goes way beyond salad. I would call it an appetizer bar. The variety and flavor of the meats are outstanding. The staff is attentive to your needs. I have been there several times and have never been disappointed. This is the place to go for a special evening with family and friends! Food is always absolutely amazing and the service is top notch. Great people great atmosphere and amazing food. Well worth the price. 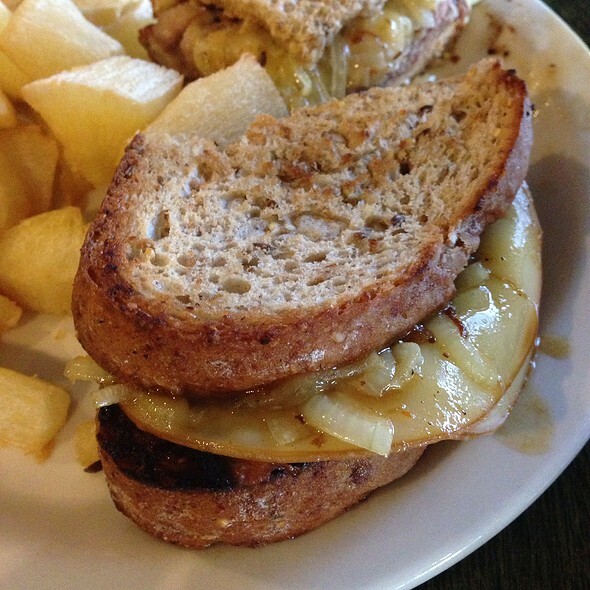 Exceptional service, delicious food! We would eat there again. Amazing selection of food. The veriety of meats is outstanding. The Brazilian specialties are wonderful. Friendly and attentive service. The service was good, it took a little bit to get our drinks, but they were busy. The food tasted a little bit on a salty side, but everything tasted exceptional. We would definitely go back for a special occasion. Outstanding meal from start to finish. Lots of choices on the buffet as well as the meats being passed around. The service was excellent in that they made sure you got to try everything you wanted and then came back for seconds of your favorites. The staff seemed to enjoy what they were doind and for me that makes it a more enjoyable experience. We will definitely be going back!! Very good food and service. Will definitely return. We wanted to do something special for our 10th wedding anniversary so we gave Green Forest a try. The experience was fantastic. 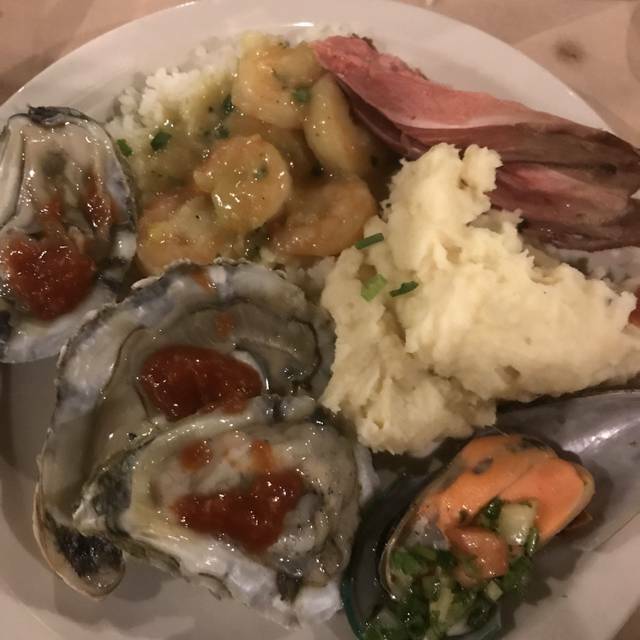 Everything we ate was delicious, our server was attentive without being overbearing and the restaurant was clean and comfortable. It is a bit pricey ($45.95 per person not including drinks, dessert, or tip) but it is absolutely worth it. We will be going back. Perfect in every way. Not my first visit and won’t be my last. 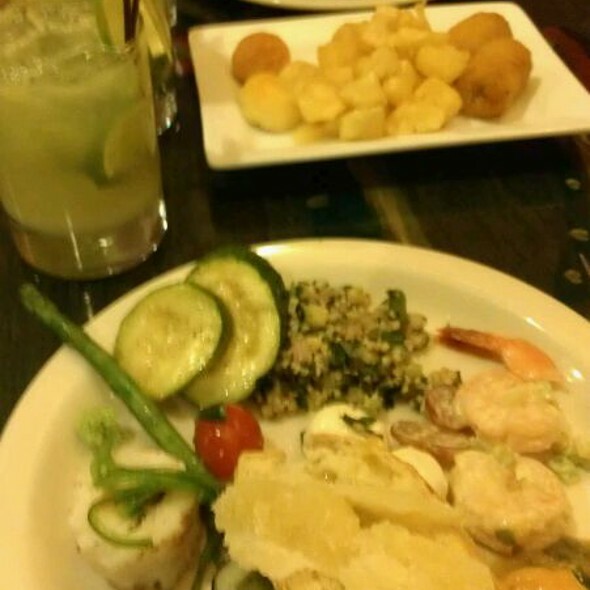 We had never been to a Brazilian style restaurant before, but we had heard good things. The actual experience was MUCH better than what we heard! Each of our servers were courteous and went out of their way to make sure we had a great dining experience. The background music was nice, but not so loud that it hindered conversation. And the food was out of this world! Such a variety of meats and flavors, and they just kept coming!! Wow! Easily one of the best dining experiences we've had! We'll be there for every occasion from now on! Great service. Meat was good. Cheese and breads were dried up. Good coffee. Dessert is xtra. Could use better decor in the place. The average person might nit care for the sides. My girlfriend has to have her meat served well done for medical reasons. The servers were very accommodating and made sure she had plenty of choices cooked to her liking. Have been there many times and will be going back. The seafood/salad bar was outstanding. The most tender octopus I ever had. The salad and appetizer bar is fabulous. For those who enjoy many choices and a lot of items to select from, you will enjoy immensely. They also have a birthday promotion. The staff are very attentive and try hard to suit everyone, with a constant flow of meats to select from. A little pricey, but less than other Brazilian steakhouses. Oh, and you can bring your own wine, for a corking fee. A special place for special occasions! 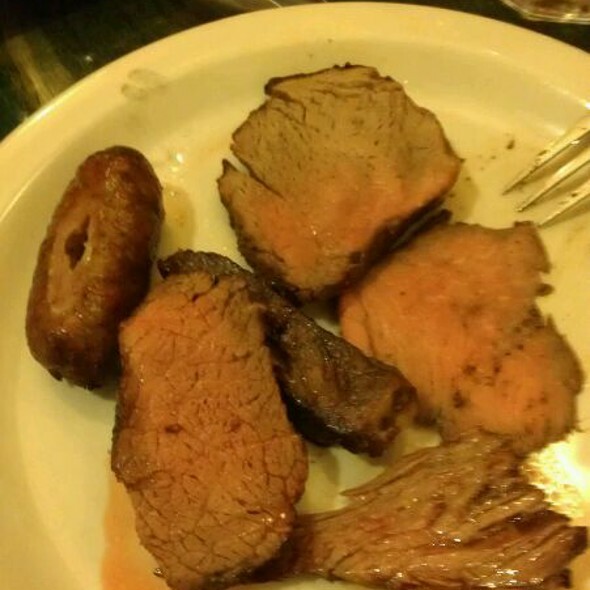 The meats were excellent, the side and salad bars were very good with Brazillian choices. Would like to see more hot vegetables. Go there at least twice a year. Wonderful food and great service. Highly recommend. Great food, great service. I’ve been there several times and will be back again. Good food, good service. For a special occasion would search else where if you’re looking to impress based on atmosphere. Good food at a good price. Been here in the past on the weekend, 1st time on a week night...... the service and staff are a lot better on the weekends by far. Cocktails are excellent and selection of dishes in the food bar area is good and always tasty. There are 3 churrascarias in the Pittsburgh area. This one has the best food.